Guido van Helten is interested in everyday people. His episode will take place in the grain milling town of Manildra, 300kms west of Sydney. Here he aims to meet members of the community there, learning about life in regional Australia. He will photograph the people he meets and render them on the flour wagons from the local mill, which will then travel through NSW, taking the stories of the community with them. Guido van Helten hails from Brisbane and now travels the world painting large scale site specific murals, particularly featuring portraiture of people somehow connected to their local community. Guido paints striking, realistic portraits, in a unique “watercolour” style. He is very process oriented, mixing all his own spray paint colours by hand. He often paints from photographs taken onsite of people he meets. Guido has an affinity with high risk, challenging or isolated locations, having worked in Iceland, Svalbard, Ukraine, Chernobyl, and many areas of regional Australia. 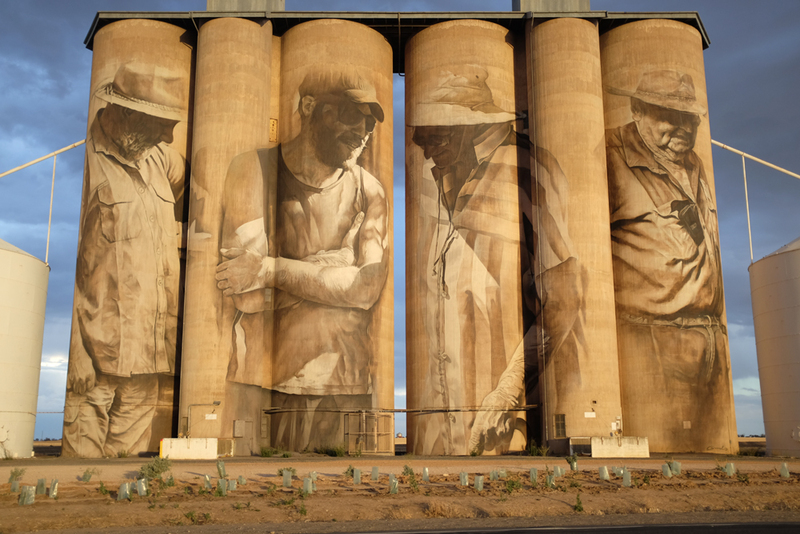 His Brim Silo project completed in 2015 caused a spike in tourism to a struggling town in regional Victoria and made national news in Australia, with major coverage on both television and in print media.